Elizabeth and James Nirvana Bourbon - 30ml EDP - $82, 50ml EDP - $107, 10ml EDP Rollerball - $30 - a bold, oriental-woody scent with a provocative blend of sultry vanilla bourbon, oakwood and a hint of tuberose with intoxicating confidence. Elizabeth and James Nirvana Rose - 30ml EDP - $82, 50ml EDP - $107, 10ml EDP Rollerball - $30 - a seductive floral blend embodying the heart of a dark rose with notes of rose de mai, geranium and vetiver for a confident, refined scent with intrigue. The Rose De Mai is very distinctive, spicy rose with impressive staying power - it's too floral for my taste but rose lovers are going to like this one. On the other hand Vanilla Bourbon is perfect for anyone who loves vanilla but finds most vanilla fragrances too sweet - this is a smoky vanilla with a touch of floral that also lasts. 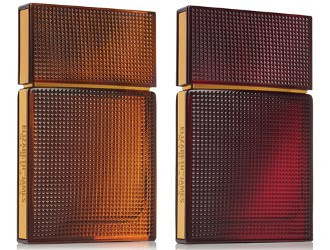 I especially the love the bottles - Bourbon comes in an amber toned bottle with rich gold accents while Rose is in a scarlet toned bottle with rich gold accents - both blends feminine curves with contrasting architectural lines - they kind of remind me of a Zippo - which would be a really cool lighter!